Next week at CVS you can get Aleeve 80- 100 count for $6.99 down from $8.99. 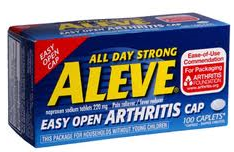 First print this $2 off 1 Aleeve 80 count or larger coupon from Coupons.com and use it at CVS 11/20 – 11/23. Fisher-Price Laugh and Learn: Learning Kitchen $35.32 + FREE Shipping! !